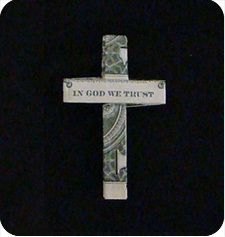 This Money Inscription Cross is unique in that it shows the words: “In God We Trust”. 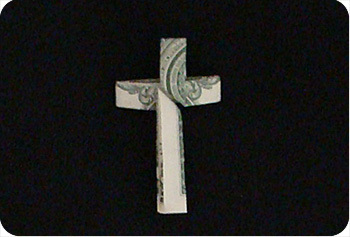 The design was inspired by the $Inscription Cross created by Charles Bast as shown here. 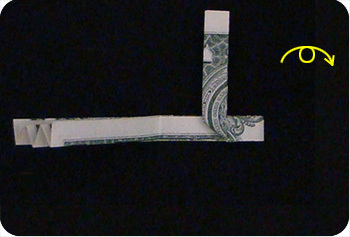 Start with a crisp dollar bill with the black-side of the bill facing up. 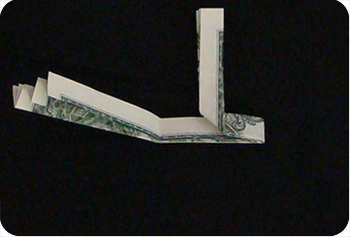 Fold and unfold a dollar bill in half and then into quarters. 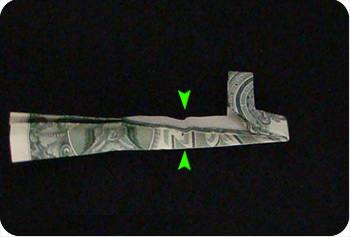 Fold down the top-edge of the dollar bill so the bill is divided into eighths. 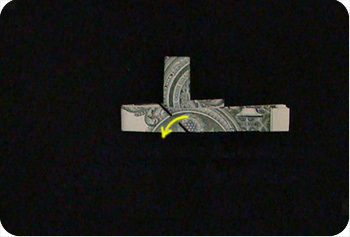 Use the crease made in step 1 to fold back (mountain fold) the dollar bill at the 1/4 mark. 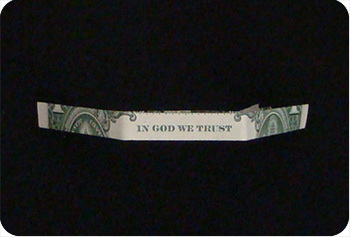 Fold up the bottom part of the dollar bill so the inscription “In God We Trust” is still visible. 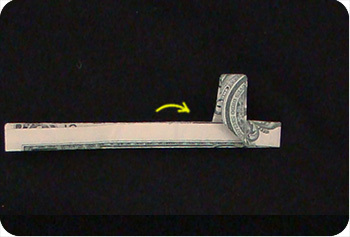 Continue to pleat (accordion fold) the dollar bill but always keeping the inscription visible. Make mountain folds on the left and right of the inscription. Work on the back side of the model. 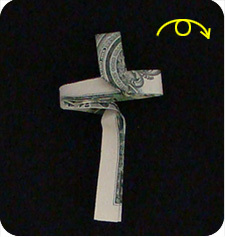 Fold the right side of the model towards the left (crease already made from step 6), then at the center of the cross, fold the paper up. This section will be the short segment of the cross above the horizontal bar. As it is, the fold is not very stable because the paper is thick. 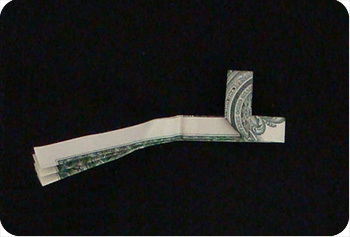 To make the fold more stable, you need to change it to a reverse fold. To do this, release the folds a little and invert the right-side of the paper at the location of the crease made in step 7. 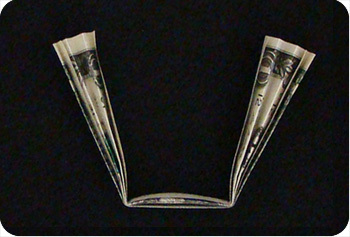 This is how it looks like after the reverse fold. Note how the colors have changed on the short-arm of the cross. Fold the top-arm of the cross down about half way. 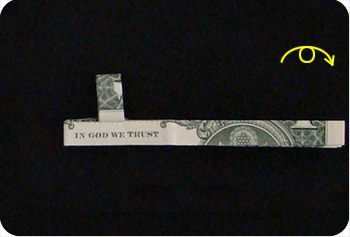 Tuck it into the layers of paper behind the “In God We Trust” inscription. Fold the left side of the model towards the right (crease already made in step 6). 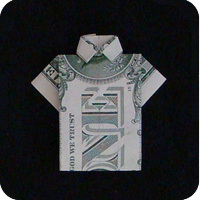 Fold the paper so it points downwards. This will be the long-arm of the cross. Place the fold so the long-arm of the cross is directly below the short-arm of the cross. This is how it looks like. Again, the fold is not stable. To make it more secure, you will need to change it to a reverse fold. Allow the folds to relax a little. Pry open the layers of paper behind the inscription. 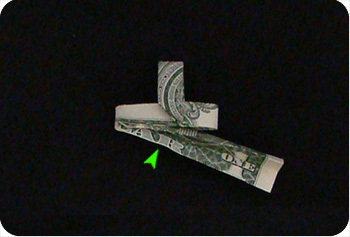 Fold the left-side of the dollar bill towards the right and tuck it in between the layers (crease is already there from step 11). Reverse the fold made in step 12 (green arrow head). 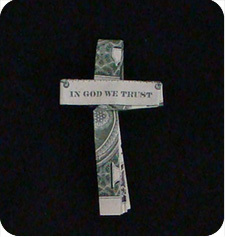 The money inscription cross is pretty much done. Tuck in the appropriate layers more securely, make minor adjustments as necessary. Turn the model over. The first one you make (shown on left) won’t look great, but they’ll look better and better as you get used to the process. 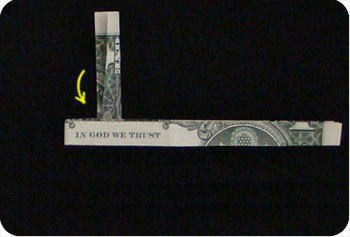 By the second attempt (shown on right), the money inscription cross is much improved. 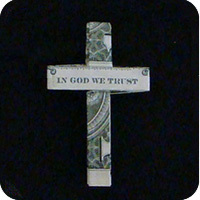 The key is to figure out where the middle of the cross is so the cross is symmetrical. 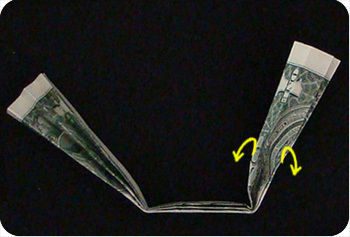 Keep in mind that the dollar bill is quite thick so it takes up space when you make a fold. 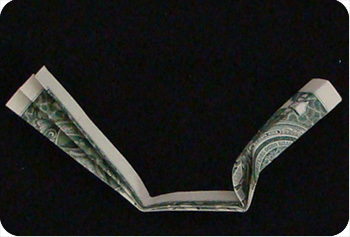 If you want your money inscription cross to be even more stable, place it under a heavy book for a few hours to reinforce the creases.